Joe Hill seems to have progressed a long way in a short time, with fine stories published over the last few years, and with a novel -- Heart Shaped Box -- due out in 2007. But Hill has been around longer than that, with his earliest stories published in smallish venues. The oldest one here dates from 1999, though the first Hill story I read was published two years earlier than that: the impressive but harrowing "The Lady Rests" in Palace Corbie 7. 20th Century Ghosts collects fourteen stories. Two of them are originals, but as many of the reprints -- including some of the best ones -- were published in particularly obscure places, they will be fresh to most people reading this collection. One of these is "20th Century Ghost" (note the singular) itself, originally published in The High Plains Literary Review, in which a man looks back on the cinema he has run for years, and its resident young girl. It's a beautifully written piece that says as much about the romance of the movies and of old movie houses than it does of ghosts, and shows that Hill can touch the heart as well as he can harrow. That's also true of "Pop Art" (originally from a Jewish-themed anthology Of Signs and Wonders) which takes a silly premise -- a boy's best friend is, due to a rare condition, an inflatable balloon -- with a punning title and creates something genuinely heartbreaking. "My Father's Mask" (original to the book) is a surreal tale that can't be "explained" but certainly makes its impact. It's clear from these stories that Hill is a later-generation writer of horror and dark fantasy: he's steeped in the genre, is aware of what came before him, and uses its conventions with a knowingness rather than the clumsy naivete that could have been the case. "You Will Hear the Locust Sing" tips its hat at Kafka and at 1950s nuclear-age monster movies in its story of a boy who wakes up to find himself transformed into a giant bug. The same can be said of "Best New Horror", which relies in part on its readers' familiarity with the genre conventions it exploits. Boys and young men, especially ones who are in some ways socially dysfunctional, figure largely in Hill's stories, notably in "In the Rundown" and "Voluntary Committal". Many of the stories are in the longer-short/short-novelette length range (roughly 6000 to 10,000 words) but "Voluntary Committal" shows that Hill can expand up to novella length without any loss of effect. 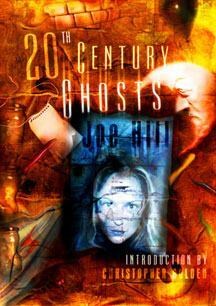 There are some fillers in the book, but 20th Century Ghosts is a fine collection showcasing a newer author of considerable talent. 20th Century Ghosts has an introduction by Christopher Golden. It is available in three editions: an unsigned trade paperback, a signed hardcover and a deluxe slipcased hardcover which includes an additional story, "The Saved", plus the deleted chapter from "The Black Phone" and notes on each story by the author. non-fiction - more reviews of Joe Hill's work.